Yes, I realize that it’s summer, and that bread pudding is usually better-suited to cold-weather eating, but, you know what? I live in San Francisco where 55-degree days are not uncommon in July, so I figured a spicy, chocolaty, cinnamon-y bread pudding was totally appropriate. Serve it with a scoop of White Peach-Ginger Ice Cream for an overwhelmingly delicious melding of the seasons. Note: You probably have most of these ingredients at home already, so don’t wince too much at the $18.50 price tag. 1/8 cup cocoa powder $4 for 8 oz. 2 tsp vanilla $4 for 4 oz. 2 tsp Ancho chili powder, plus more for garnish $1.50 for 1 oz. Preheat oven to 325 degrees F. Lightly grease 1 8" square/round pan or 4-6 ramekins (depending on size) with a little vegetable oil or butter. Set aside. In a large saucepan, over medium heat, whisk together the half-and-half, sugars, cocoa powder, vanilla, cinnamon and chili powder. Slowly add the eggs, whisking throughout to avoid scrambling the eggs. Continue whisking until a rich, creamy custard forms. Carefully stir in the bread cubes and chocolate chips. Remove from heat and allow to sit for 10 minutes. Pour mixture into prepared pan(s) and bake for 20 minutes or until pudding has set. Allow to cool slightly. Garnish the bread pudding with a sprinkle of chili powder. Serve either warm or chilled. Can we get some measurements on that “baguette”? 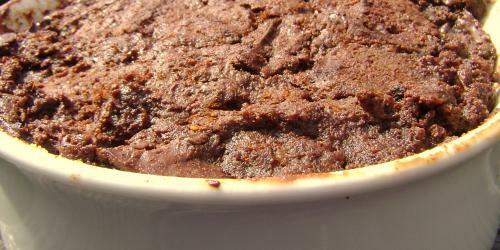 Chocolate chili bread pudding and all the process of making chili chocolate bread pudding. All the ingredients is mention here if you want to make this chili pudding in your home then you take all the recipe for you. Which helps you to increase your interest to make this pudding.